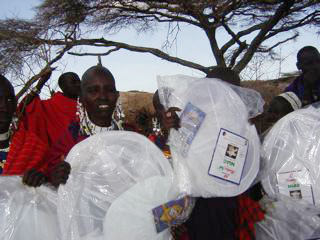 As you know, we set a goal to raise $10,000 dollars to provide Insecticide Treated Nets (ITN’s), anti-malarial medication and test kits for the 6 boma of the Olduvai Region of Maasailand in Tanzania. We accomplished that goal. We sent 100 ITN’s medication, test kits, a medical team and provided basic community health skills to our friend on the ground in Oldupai Boma, Metwiy Sabore, in December of 2009. Our intended timeline for rolling out the same services to the other 5 Boma of Kiloki, Ndemwa, Loongooku, Elerai, and Ngolola was early April. Dealing with manufacturers and service providers in an impoverished country half way around the world, trying to put plans into action, is not always a simple process. We found ourselves negotiating with A-Z Textiles, the provider of ITN’s, for a reasonable price, because we were in the peak of malaria season, and the nets had a premium. After much negotiation, we were able to get the nets for an acceptable and affordable price of $7 each. These nets will last 5 years. This delayed our deployment of the medical team and nets to our friends in the Olduvai Region until May. As you all know, it was my intent to travel to Tanzania to particpate in the delivery of Nets, medications and test kits and to particpate as part of the field team. However, concurrent with all of this planning, one of our children has been diagnosed with a medical condition that has required surgery and follow up that did not allow for that trip. We could have waited a few months, but malaria was hitting the six Boma very hard and the Maasailand Health Project Board of Directors made the decision to send our on the ground partners, Terrawatu, into the field. >> year. It will be great to see you again. How is your child who were sick? >> you too in your life. The goal of Maasailand Health Project is to assist our Maasailand friends in developing a plan of health care that will eradicate malaria and improve general health in these six Boma. We will continue with semi-annual field team trips, and continue our fund-raising efforts. Our Tanzanian Coffee through Princess Valiant, http://www.princessvaliant.com is an on-going fund-raising event. In four months, we have generated $929 in revenue through the generous partnership through Princess Valiant. We currently have approximately $1,000 in the bank, and the cost of a three day field mobilzation and medication will run approximately $3,000 every six months. It is my intent to travel to Tanzania in October for the next field team visit. If any of you are interested in participating, please let me know. I would like to start planning for this soon. I am grateful to all of you for your generous donations. Very greatful. I am humbled by our sweet, kind friend, our adopted Maasai son, Metwiy Sabore. He is working hard for us and for his people. I will send photos and update our website when I recieve the CD in the mail. We have had tremendous success in large part due to local support in Port Angeles and Sequim from the Peninsula Daily News, the Sequim Gazette, Dave and Ann Johnson (Dave’s birthday party last Saturday night was a Maasailand Health Project fundraiser) from Edna Petersen of Necessities and Temptations, and our Princess Valiant coffee and chocolate fundraiser. To date we have raised $7,060 in actual cash. We have another $1,750 in pledges still due to come in. This brings our total fundraising dollars to $8,810. I am in awe of the support from our community, family and friends. We have extended this fundraising drive to go through the end of March with the hope of reaching our goal of $10,000. I am currently negotiating prices in Tanzania with a variety of providers as prices have gone up due to the onset of Malaria season, but we are making progress and I hope to have this completed by April 1 as well. Successful Fund Raising Event at Necessities and Temptations! Last night’s fund raising event at Necessities and Temptations, hosted by owner Edna Petersen, was extremely successful. We had about 15 people show up to hear about the Maasailand Health Project and ask questions of founders, Tom and Rhonda Curry. The event recieved media coverage in the Peninsula Daily News and raised $1,045 dollars for the Maasailand Health Project. Special thanks to Edna Petersen for thinking of the event, promoting the event, and sponsoring the event! 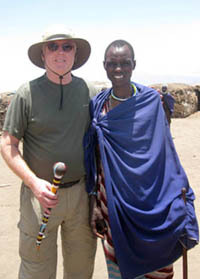 Tom Curry will be available to discuss the Maasailand Health Project and share recent communications from Metwiy Sabore of Olduvai Boma, the village Maasailand Health Project assisted last December. I would like to take this time to thank the following people. Jenn Putnam of Jennergy, Inc. http://www.jennergy.com for our awesome new logo design. Notice the Maasai woman silhouetted in the trunk of the African acacia tree. This logo truly catches the spirit of Maasailand and the Maasailand Health Project. Denise Brennan, owner of Princess Valiant Coffee http://www.princessvaliant.com for creating the coffee and chocolate fundraising event. Please visit Denise’s website and purchase a pound of our Tanzania Peaberry coffee or some Tanzanian chocolate. All proceeds go directly to Maasailand Health Project. A true heartfelt thanks to these very special women who donated their time and talent to help move Maasailand Health Project forward. Our first shipment of 100 nets, 50 blood test kits, 30 treatments of medication, and training for our friend Metwiy all took place this past weekend. After much research, we entered into an agreement with Terrawatu, a Non-Government Agency based out of Arusha. They provided the supplies and transportation needed to outfit this village in our effort to eliminate the threat of malaria. In addition, we had Dr. Isack Kuysa of Arusha, Tanzania provide medical training on site at Oldupai Boma. All of this has been accomplished with $2,000 in cash, lots of research, and a commitment to help a portion of the Tanzanian population, the Maasai, that is grossly underserved. This is our first of many steps. Thank you to all who have contributed time, talent and money in making this come together. First Month Successes of Tanzania Relief Fund! 1. We incorporated as a Non-Profit Corporation in the State of Washington in mid-November 2009. 2. We set our first Board of Directors meeting for January 11, 2010. 3. We have done massive research and communication with numerous agencies in Tanzania and in the U.S.
4. We have developed a relationship with a Non-Government Organization in Tanzania called Terrawatu to provide mosquito nets, blood test kits, and medication. 5. We have developed a relationship with a physician to train Metwiy (the english teacher from Oldupai Boma (the village we visited on our way out of the Serengeti). 6. Our first delivery of 100 Nets, 50 blood test kits, and 30 treatments of medication are being delivered next week. 7. Terrawatu representatives will photo document, the procurement, transportation and delivery of the nets, test kits and medication, as well as the training of our Metwiy as a para-medical assistant for his village.